Just north of White Beach is the 200-meter-long Diniwid Beach. This lovely cove may be reached by walking north from White Beach along a picturesque path hewn from the cliff. There is also a good access road from the Main Road to the back of the beach. Much quieter than White Beach, it is ideal for picnics and snorkeling. There are a few inexpensive island-style bars and restaurants and simple cottages as well as bamboo houses of unusual design. 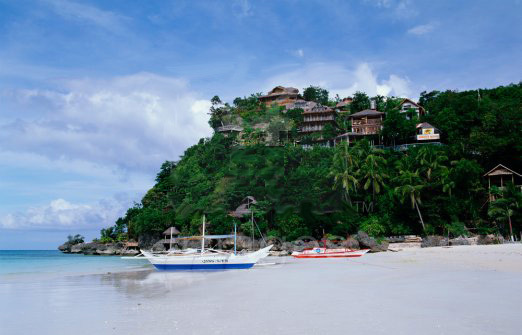 It is home to resorts like Artista Boracay Beach Resort, Microtel Boracay Reosrt and Boracay Westcove Resort and more. Some of these accomodations have fully-equipped kitchens and are located directly on the beach. On the steep cliff that rises out of the sea on the north side of this beach is the luxurious Nami Resort. Close to it are some upscale town houses. Unlike the famous White Sand beach this Boracay beach offers a less crowded shore. The cliffs around it also give it a sense of mystery and adventure coupled with tranquility and peace. To return from Diniwid Beach to Boracay Beach click here.